Former England captain Charlotte Edwards was guest of honour at the opening of the Sir Rod Aldridge Cricket Centre. Charlotte, who retired from international cricket recently, was the first player, either male or female, to score 2,500 runs in T20 internationals. She led England on 220 occasions, during which time the side won three Ashes series and was a Wisden Cricketer of the Year in 2014. Current New Zealand women’s captain Suzie Bates was also present at the event. Bates, who was the ICC Women’s ODI Player of the Year in 2013, is a Southern Vipers ambassador, along with Edwards. The centre will be home to the Aldridge Cricket Academy (ACA), a unique partnership between Brighton and Portslade Aldridge Community Academies and Sussex Cricket. It will enable sixth form students to study for academic qualifications alongside professional cricket development. The centre will provide students with dedicated training and playing facilities. It will also promote sporting excellence in order to enable local students to develop cricketing talent and maintain fitness. This specialist state-of- the-art cricket centre includes three lanes of indoor cricket nets with full run ups, full service gym for strength and conditioning, physiotherapy room, a Sussex Premier League standard cricket square. The centre has been designed with Sussex Cricket to be a hub for cricket in Brighton and Hove. It will be the home for the ACA and also be used by local primary schools. This indoor school will be a base for Sussex Women’s and Girl’s cricket in the future as well as a satellite for the Sussex Cricket Academy and for Sussex’s Emerging Players Programme. Portslade Cricket Club, who are already using the centre, will make the centre home to their first and second teams from next summer. It is hoped the site will become the home for cricket in Falmer and the local community. Club captain Luke Wright and fast bowler Tymal Mills were also present at the opening ceremony. Wright, who has also played over 100 times for England in one-day cricket, is captaining the Sussex team across all three formats of the game for the first time this season. 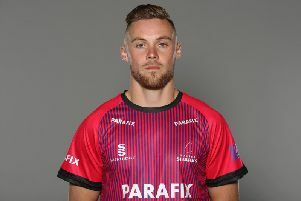 Mills, who attended the ceremony to mark the building of the new centre back in October, has been chosen in the England T20 squad for the first time, for next week&#39;s match against Sri Lanka. Sir Rod Aldridge said: “This facility is a wonderful asset for BACA and PACA, and for the development of young cricketers in Sussex as a whole. Aldridge Cricket Centre is in the grounds of Brighton Aldridge Community Academy at Falmer. Guests at the launch event included senior representatives from the English Cricket Board, Sussex Cricket, and Brighton and Hove City Council, as well as players from Sussex, local cricket clubs and members of the local community. Construction of the £1.8m centre, which has been funded entirely by private donation and sponsorship, was completed last month and the facilities are now available for hire by clubs and community groups.